Revealed as the third successor by Bhagatji Maharaj, Shastriji Maharaj exhibited extraordinary intellectual and divine powers from early childhood. There seemed to be no field which he could not master, ranging from Sanskrit and scriptures to mandirs and architecture. Behind his warm smile, lay a spirit of fire - never compromising truth or yielding to opposition. Named Yagnapurushdas in sadhu life, he emerged matchless in spiritual disciplines among all sadhus of his time. 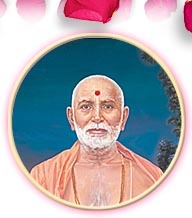 He left the parent body with merely five sadhus and a handful of devotees to propagate the philosophy of Akshar Purushottam as revealed by Lord Swaminarayan. There was scathing abuse and rabid opposition - yet, his saintliness refused to answer insult with insult. To him, animosity was alien. In 1907 CE, he established the Bochasanwasi Shree Akshar Purushottam Swaminarayan Sanstha and erected five beautiful mandirs with the images of Akshar Purushottam installed in the central shrines. Life Span: 86 years (1865 - 1951 CE). From 31 January 1865 CE (Maha sud 5, 1921 VS) to 10 May 1951 CE (Vaishakh sud 4, 2007 VS). As Guru: 54 years (1897 - 1951 CE).